There seem to be many versions of caponata. Sometimes it is treated almost like a eggplant based vegetable stew and other times it moves closer towards a salad. My favorite one is definitely a salad / cold appetizer of roasted vegetables. That's what it looked like at l'Osteria. Eggplants are always used, but the rest of the vegetables can vary. 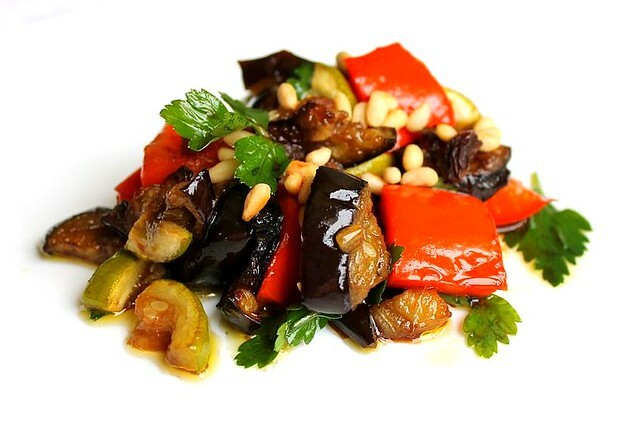 At l'Osteria, caponata was made with eggplants, zucchinis and bell peppers. To me in this dish the crucial thing is how the vegetables are cooked. I don't really enjoy the eggplants stewed together with tomatoes (as it is often done for caponata). It was the hardest thing to figure out how to cook them, so that they turned out same delicious as they were at l'Osteria. The way I chose now is to slice the eggplants first, then toss them in some good olive oil (so that they are coated), spread the pieces into one layer on a baking sheet covered with foil and roast at 180C till they are completely tender and start browning on the outside. Same works really well with zucchinis or courgettes. With the peppers I go differently. I roast them whole or halved first and till they are tender, then wrap in foil and let them rest a bit. Then - slice. The dressing can also make a lot of difference. My favorite one is based on balsamic vinegar and sugar, so it is intense sweet and sour. It is not always done, but for me it is also important to have some uncooked greens mixed in (it could be rocket as it is done at l'Osteria or even parsley leaves) together with crunchy pine nuts and sultanas sprinkling. Making it is nothing difficult and not too much time. It is so much worth trying. Toast the pine nuts in a dry pan till they start browning. Remove from heat and let cool. Cut the eggplant lengthwise into quarters and slice across 1 cm thick. Put the eggplant pieces in a medium bowl, add 2 table spoons of olive oil and toss, so that the pieces are coated. Spread the pieces into 1 layer on a baking sheet covered with foil. 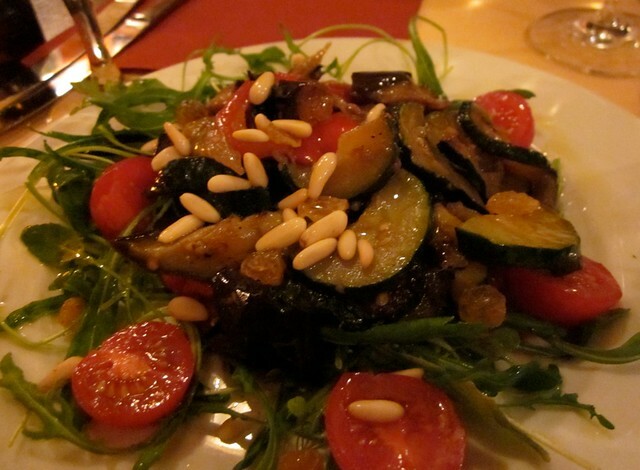 Do the same with zucchini (courgette) - this time 1 table spoon of olive oil is enough. Place the whole half of the bell pepper on a baking sheet covered with foil (no oil is needed). Roast the vegetable at 180C for around 30 minutes. After 15 minutes, gently flip and move around pieces of eggplant and zucchini. They should become completely soft and start browning. The pepper will just soften a bit. Take all the vegetables out of the oven. Transfer eggplant and zucchini into a mixing bowl. Wrap the pepper in foil and let it rest for 5 - 10 minutes. Unwrap and cut into squares 1.5 cm. Add to the eggplant and zucchini together with the juices. Whisk together 1 table spoon of olive oil, balsamic vinegar, sugar and salt. Add the dressing to the vegetables and toss. Mix in the parsley. Serve sprinkled with sultanas and toasted pine nuts. It will keep well in the fridge for 2-3 days.